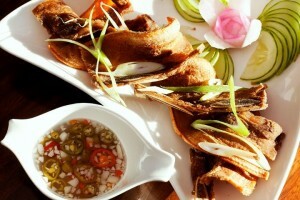 Boracay Island is known to have a roster of restaurants that serves a wide variety of palates. 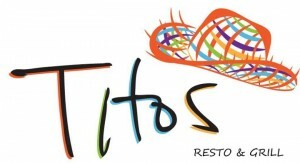 A new addition last April was introduced to this reputable list, Tito’s Resto Grill in Station 2 (refer to Guidebook Map F4) located just above the newly renovated Pat’s Creek Bar. Tito’s offers a modern twist on the traditional Filipino cuisine. The interior design is very well thought of and styled to entice a lot of good art conversations. The place at Tito’s Resto Grill is meticulously decorated with tasteful artworks and updated design, without losing the Filipino flare on specific pieces. The colors and furnishings are fresh with just a hint of stylish beach décor. The panoramic window overlooking the White Beach is spectacular; while upstairs is an exciting outdoor dining. The ambiance is relaxed and casual mixed with the experience of fine dining. Some signature dishes are the appetizers like Hunghang Chicken, Balot ala Pobre, entrées like the Crispy Tilapia with Mango Salsa, Carbonara Pizza and their locally famed desert, Fried Halo-Halo. The price is fair in comparison with the serving portion. I got a chance to experience their refreshing grape shake and other dishes. The crispy tilapia was unforgettably so delicious. Their cuisine is a break away from the mirroring tastes that are already redundant around. It is an innovation from traditional, but the presentation that speaks for the “now.” They automatically ask for the 10% service charge on your bill, but they have an impeccable and friendly service and it would be worth it. I highly recommend this restaurant. It is a refreshing experience, especially when you are overlooking the pristine blue water outside during lunch time. You will hear the coconut trees swaying and serenading like a sweet tropical symphony while you are enjoying your food. Food is excellent and price is definitely fair. If you are to eat there during dinner time, you can conclude your night at Pat’s Creek Bar downstairs. They have a billiard table by the back and enjoy a game of pool while drinking to your favorite beverage. Then proceed to the outside seating by the beach and listen to one of the best bands in the island. They play mostly reggae songs, not the overplayed ones and some fresh renditions of popular songs and rock songs. Relax with a Redhorse Beer or favorite mixed cocktails. It will be served cold to your table near the stage. Or if you feel like club dancing, proceed to all the night clubs that stretches on White Beach. And better yet, go home and retire to your nice hotel room with a satisfied appetite, enjoy a peaceful evening with your partner or family and get ready to embark on the next morning’s island activities. During Habagat season, they also have free delivery to your hotel room if you would like. You can also reserve for huge parties for dinner time and or for private parties and small events. Please do arrange with the restaurant directly. This entry was posted on Monday, August 20th, 2012	at 2:23 pm	and is filed under Food & Dining, Recent	. You can follow any responses to this entry through the RSS 2.0	feed. You can skip to the end and leave a response. Pinging is currently not allowed.